The Center for Education Integrating Science, Mathematics, and Computing (CEISMC) enhance PreK-12 and post-secondary STEM education by drawing upon the expertise and scholarly contributions of the Georgia Tech community. 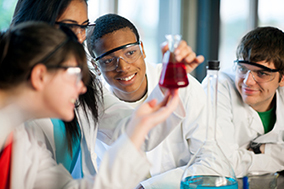 CEISMC advocates for and leads systemic changes to increase STEM interest and achievement for all students, especially those underrepresented in STEM. CEISMC’s research efforts allow for the identification and dissemination of evidence-based best practices in STEM education. CEISMC will define and exemplify effective STEM education to maximize students’ readiness to excel in a rapidly changing world. We are leaders in influencing significant curricular, pedagogical, social and policy reform efforts that will shape STEM education and workforce development. Excite, engage, and accelerate PreK-12 students through high-quality academic and hands-on STEM enrichment programs. Partner with the Georgia Tech faculty and students, as well as businesses, non-profits, and education communities to expose PreK-12 students to leading-edge research and 21st Century STEM careers. Empower teachers to advance student interest and learning in STEM. Offer professional learning experiences that focus on cutting-edge STEM content and model effective, active, and inquiry-based pedagogy. Utilize digital platforms, innovative tools, social media, and online communities to create professional learning experiences that erase the geographic and temporal boundaries for learning. Cultivate sustained PreK-12 school and community partnerships to develop model sites in STEM. Engage teachers and students in on-going experiences with Georgia Tech faculty and students to improve STEM teaching and learning. Design and develop innovations that advance the educational frontier in STEM. Create effective curricula that incorporate inquiry and problem-based learning, culturally authentic practice, high standards, and advanced technologies that work in a broad array of educational settings. Advance PreK-12 STEM education through educational research and evaluation. Document the impact of innovative curricula, teacher professional learning experiences, and novel STEM programs on student learning, with an emphasis on students traditionally underrepresented in STEM. Create opportunities for the Georgia Tech community to engage and serve PreK-12 students and teachers and the community at large. Assist Georgia Tech faculty in developing innovative educational initiatives inspired by their novel and creative STEM research and teaching. Initiate and coordinate outreach experiences for Georgia Tech students and staff to broaden their horizons, promote community engagement, and inspire a culture of service.